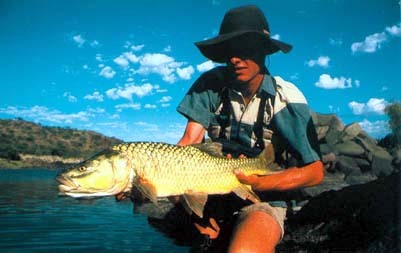 I saw this advert for a guided trip to catch the elusive largemouth yellowfish labeobarbus kimberleyensis with two very experienced guides, Arno, Mathee and Gerhard Laubscher, down near Kimberley. The price may have seemed high to the uninitiated but then the best always costs more. I booked for son Tim and I. Booking and paying for the guides works out far cheaper and more effective in a case like this, Tim and self had caught largemouth using other methods before but never on fly. We had caught most other freshwater species on fly and were looking forward to a new experience - that is what angling is all about. We stopped off at the bustling burg of Bloemhof, which is next to Bloemhof dam, one of the premier angling venues in the country, well known by the coarse angler. Tim and another brother Terry have fished this venue for carp and catfish, landing carp up to 8kgs and tackle busting catfish up to 15kgs on fly. Water clarity is a problem and involves hunting for the fish and using "blind" fishing methods along with the knowledge of the fish’s habits. 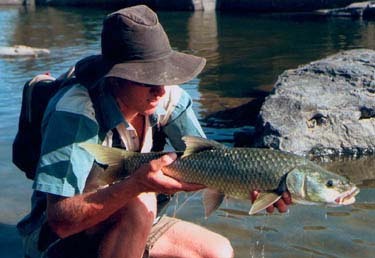 A topic of conversation on the trip was whether we were going to fish the Orange or the Vaal Rivers. This question was only partly answered when we got back and I went into the internet and surfed. The Orange river rises in the Drakensburg mountains along the border between South Africa and Lesotho and runs westward along the southern boundary of the Free State, then through the Northern Cape area and finally forms the southern border between South Africa and Namibia before it empties into the Atlantic Ocean at Alexander Bay, about equidistant between Walvis Bay and Cape Town. The most notable tributary is the Vaal, which also rises in the east of Johannesburg and forms the boundary between Tranvaal and the Free State before joining the Orange southwest of Kimberley. Smaller tributaries of the Orange and Vaal, such as the Brak, Caledon, Harts, Klip, Modder, Mooi, and Vet drain the entirety of the Free State, Lesotho and much of the Cape Provinces and the Transvaal. (Source Wikipedia The Free Encyclopedia) Are you as confused as I am? What on earth happened to the Wilge? I really must get a decent big one-leaf map of South Africa. Suffice to say we fished in either the Vaal or the Orange North of Kimberley. In the Riverton area it was sad to see all the desecration caused by strip mining for diamonds. New legislation dictates that the mining companies have to leave the area as they found it. The question is how long does it take for the veld to get back to the way it should be? We arrived at our destination and were told at the gate that there was an uptight rhino and if we saw it not to stop but to just drive on. The well-appointed lodge is situated on a hunting farm, which is well stocked with game.